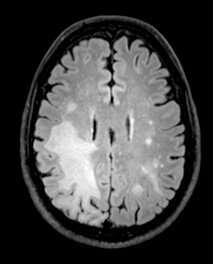 MRI of a PML patient showing significant lesions in the brain (white signal). Credit: Irene Cortese, M.D. Pembrolizumab blocks the interaction between two proteins, PD-1 and PD-L1. Normally, these proteins work by putting the brakes on the immune system to limit excessive inflammation. However, some tumors that have PD-L1 on their surface can exploit this "off switch," limiting the immune system's ability to attack the cancer. Recent studies of PML patients have suggested that this mechanism may also be involved in JCV brain infections. "We found both PD-1 and PD-L1 proteins in the infected parts of brains of patients with PML," said Irene Cortese, M.D., director of the NINDS Neuroimmunology Clinic and first author of the paper. "This led us to ask whether pembrolizumab could be a potential treatment for PML." Eight patients at the NIH Clinical Center, all of whom had signs of worsening PML, were treated with pembrolizumab. The status of their infection was monitored by MRI scans of their brains and by checking the levels of JCV in their cerebral spinal fluid (CSF). In five of the eight patients, the amount of circulating virus was reduced following treatment with pembrolizumab. Importantly, these patients' symptoms improved or stabilized, and their brain MRIs showed shrinking of infection-related brain lesions. "Previous attempts to treat PML have been disappointing," said Dr. Cortese, "so we are very encouraged by these preliminary results." "This study importantly shows for the very first time that, in this unique patient population with a high mortality rate, patients can achieve remission of an otherwise fatal infection," said Avindra Nath, M.D., NINDS Clinical Director and senior author of the study. "It will open areas of investigation and could help revolutionize treatment for similar chronic infections in the setting of immune compromise."